Reposted with permission from Katie Lance. Facebook recently made a big announcement about how the news feed would work, and it has created quite the stir. I have had countless people reach out, asking me for my opinions on what it will mean for real estate agents and brokers as well as their Facebook plan for 2018 — so I’d like to share my thoughts and recommendations here. In my opinion — this is a good thing. Don’t we all want to see more from our friends and family and less advertising and spam? Aren’t we all tired of people spamming us in the news feed? I know I am. Here’s the good news especially for real estate agents. Real estate has always been and will always be a people business. It is all about relationships and connections. So, yes, I do think it is still important to have a Facebook business page (more about that in a moment), but I think it is even more important than ever for real estate professionals to be connecting with their clients on a personal level. At the end of a transaction, are you reaching out to clients on Facebook, messaging them to let them know how much you enjoyed working with them and adding them as a friend? 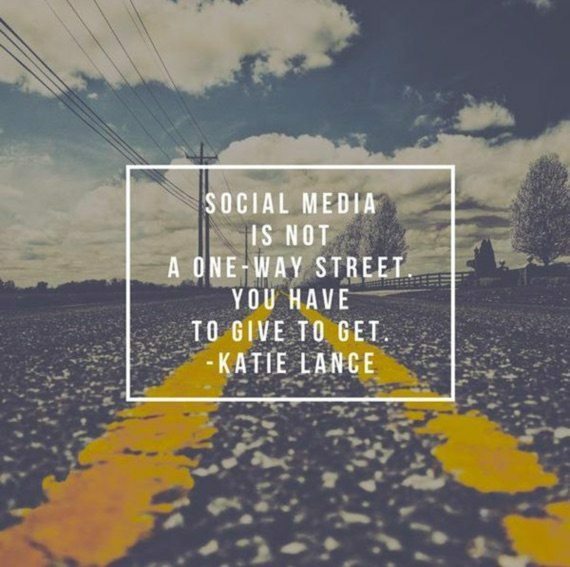 Are you then putting them into a private “client” list so you can be intentional in terms of connecting with them on a regular basis by commenting on their posts, liking their content or reaching out one-to-one on their birthday or other big life events? If the answer is yes — great! You are already on the right track when it comes to how this new news feed will work. If you have not done this yet — the time is now. Real estate is a relationship business and when it comes to social media — relationships are built with small interactions over the course of time. Every like, comment and share adds up. It has been, and always will be, about others — not you. The best way you can use your personal Facebook account as a real estate professional is to be interested in others; be intentional about being interested in your clients. I will take that a step further and say it’s more important than ever to not be a lurker and to not be a drive-by liker. Don’t just pop into Facebook and randomly like 10 things. Actively comment on things that speak to you. Share posts from your clients who are doing great things in their world. Now, more than ever is the time to be a good finder and look for moments to share great things from the world around you. 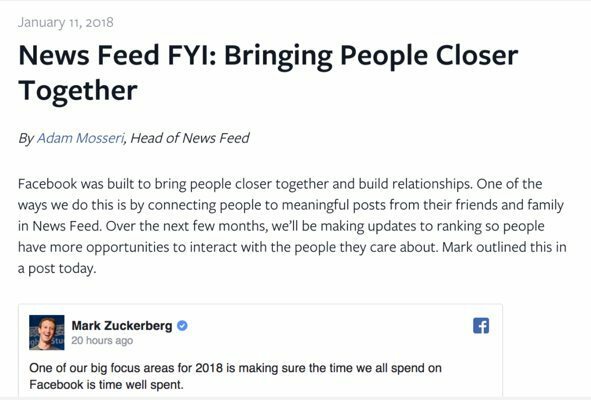 We also know from Zuckerberg’s message above that groups will be getting priority too. 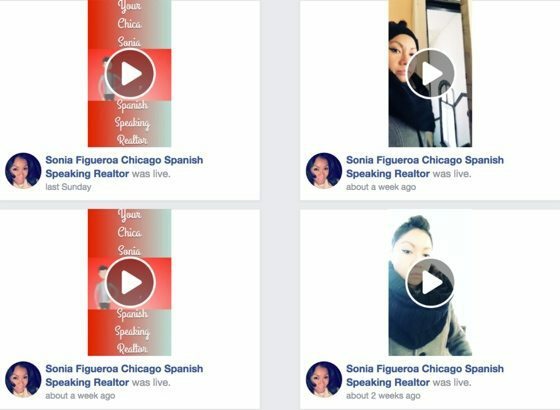 Although a Facebook business page is still important for real estate pros to post your listings, post your original content, post your videos and Facebook Live content (not to mention to run Facebook ads) — a Facebook group, now more than ever, may be a great option for real estate agents and brokers and may give you more visibility. For real estate agents, creating a local group about your neighborhood or community can be a great opportunity to share valuable local information, to bring other thought leaders and business leaders into your group and to create a local community where you are helping to lead that conversation. For real estate agents and brokers, I think it’s going to be more critical than ever to think about your Live video strategy for 2018. Live video gets more interaction, more reactions and comments than typically any other type of post, and going forward, it may be the single best way for an agent or broker to get significant traction on their Facebook Page. The key here, just like any other type of content, is that it can’t be a one-way conversation. Where I see a huge opportunity for real estate agents and brokers is in bringing real value: sharing updates about the market, tips about buying and selling homes, highlighting local leaders in the community and much more. If you haven’t already, make sure you download our free cheat-sheet with 30 Facebook Live ideas for real estate. This is a great place as you think about your Facebook Live strategy for 2018.
Who is doing this really well right now? Tons of folks like Jason Frazier, Rory Pitts, Sue “Pinky” Benson, Re/Max Leading Edge, Katie Clancy, Chelsea Peitz and Sonia Figueroa just to name a few! Why is everyone in a panic? Now is time for agents and brokers to dig deep and create a creative plan and strategy. And for the broker/owners and franchise owners reading this — now is the time to get your creative plan in place. It’s not enough to just have a social media manager running your Facebook page. Now is the time to invest in the tools, resources and staff to make this work for you. It’s not enough to just “dial it in” and post a few times a week to Facebook and automate your tweets. It’s not enough for real estate brands to “just be there.” But again — this is not news. It’s just a reminder that in 2018, you must to do more to stand out from the competition. I would get all of my past clients onto a Facebook list ASAP and start being intentional on a daily basis by interacting with at least five of them daily. I would be a good finder and look for moments each week to share great content from my clients on my personal Facebook profile. I would create a Facebook Live schedule of when I would be live on Facebook once a week sharing valuable tips and information. I would want people to be so impressed with the amount of knowledge and resources that I was sharing — that when the time came to find a local Realtor, there would be no one else they would think of but me! I would create Facebook Live content (and recorded video content) that reflected my personality and who I am. I wouldn’t be afraid to show my personality, my crazy hair or my opinions — I am who I am, and I want to attract people who want to work with me. I would create my Facebook ad strategy ASAP. I would focus on targeting the “warmest” audiences possible like the people who have engaged with me on Facebook or visited my website recently or who are in my database. After every Facebook Live or video I post to my business page, I would boost or advertise those posts to my warmest audiences possible to get the highest level of engagement. Here’s a resource to my last free Facebook ads webinar. I would get all of my agents (or managers, depending on your position) onto a Facebook list ASAP and use that list to engage with my agents on Facebook — like, comment and interact with them. Agents very rarely leave brokerages because of just the money alone. They want to be a part of something and connected to a great broker. Retain people by caring about who they are beyond their listings. By the way, as a broker/owner this is something you need to do on a personal level — not your assistant or marketing director. I would be a good finder and look for moments each week to share great content from my agents or managers on my personal Facebook profile and/or in our company Facebook group. I would make sure we have a Facebook group that someone on our team “owns” and is responsible for building the content there and building the community with my agents. If I didn’t have a social media manager on my team, I would hire one who understands the value of creating excellent content; someone who is proactive and creative enough to craft fun and interesting content that will engage the consumers who follow our page and our fellow agents. I would hire someone who isn’t afraid of the camera and is ready to lead our brokerage or franchise down the path of an effective video and Facebook Live strategy. I would make sure I support that social media manager and give him or her the resources he or she needs such as: additional team members (a video editor or a copywriter), additional resources (equipment), additional training (online or offline educational courses to up their game) and an adequate budget to boost and run Facebook ads as needed on a regular basis. I would invest the time into a weekly Facebook Live broadcast. I would be the thought leader in my market area by being on live video talking about the market, sharing my knowledge and expertise and attracting the type of agents who would be perfect for our brokerage or franchise (and letting go of the ones who are not.) I would also be intentional and make it a point to highlight at least one or two people in each broadcast. When you highlight others — they are more likely to share your content, which makes it a win-win all around. At the end of the day, in 2018, it’s not about sharing content for the sake of sharing content. It’s not about “set it and forget it.” It’s not about handing off social media to the youngest person in the room. It’s about creating great content — not just once in a while but on a consistent basis; week in and week out that is going to attract the people you want to work with. It’s about being real, being yourself and investing the time into cultivating those relationships. Real estate has been — and will always be a — relationship business. Focus on that, and you will crush it in 2018 and beyond!